The first battle system super module from TSR, Inc! The tiny village of Bloodstone Pass is menaced by an army of thousands of brigands - orcs, goblins, giants, and human renegades led by a powerful assassin. Outnumbered and helpless, the villagers must pay tribute in gold, food...slaves. Two villagers have traveled far to find aid for their people. They have turned to you, brave and powerful adventurers, as their only hope. They cannot afford to pay more than a few silver pieces a day, but their need is great. 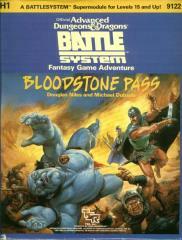 You are invited to save the people of Bloodstone Pass. Can you organize a defense, train and equip the peasants, recruit allies, gather intelligence...and win the war? BLOODSTONE PASS is an exciting good-aligned, high-level (15+) adventure that combines roleplaying with the thrill of mass combat. A complete 3-D ADVENTURE FOLD-UP village makes the battle come alive!